Yardistry products have been specifically designed and manufactured to provide all individuals with the opportunity to style and create an oasis in their own garden. This is achieved through the different variations of screens, structures and fences that are all available at cost effective prices, so whether you are a professional customer and a keen amateur the possibilities for your garden design are endless. This unique modular system, provides customers with the ability to establish hundreds of structures and designs through the use of fifteen basic components. 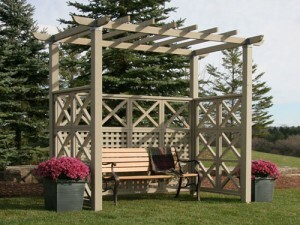 Whether you are looking to create an area of shade or redefine an area of your garden or living space, Yardistry structures has all the components that you might need to create this. Screens that help to bring delineation to an area or assist with the filtering of a view, or fences to create privacy and further enhance the natural features of your garden. Yardistry’s unique fifteen SKU’s provides the ultimate in flexibility, style, quality and craftsmanship that will help to enhance any landscape. What is Yardistry made from? Yardistry is a wood-based product which has been manufactured from exterior grade cedar (C. lanceolata), the product is then finished with a water-based stain to ensure lasting enjoyment. Yardistry’s post top connectors, post caps and panel clips are made from marine grade aluminium which is then powder coated, and include stainless steel hardware. Yardistry have spent time to ensure that the materials and manufacturing methods used guarantee the long term durability of the product. Every effort has been taken to ensure the highest quality of product with the entire range of Yardistry products. The quality furniture-like finish shows true product craftsmanship. Although Yardistry’s products arrive pre-finished with a factory-applied water-based stain, customers can further enhance the appearance of their chosen structure by the simple application of a semi-transparent stain over the factory finished product. The Yardistry product line offers designers, contractors and home owners infinite possibilities to solve their landscaping challenges. Whether creating garden features, a shaded escape from the sun or a cover for hiding an air conditioner or recycling bin, Yardistry provides flexible designs to allow you to build the perfect solution for each. We recommend that consumers, designers and builders refer to their local building code for post anchoring methods suitable to their respective application, surface and soil conditions.